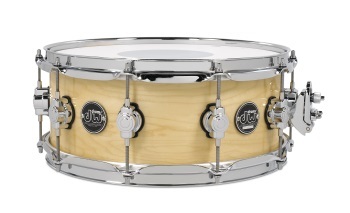 Crafted from 10 plies of North American Hard Rock Maple, the same exact maple used on DW’s legendary Custom Shop Drums, Performance Series maple snares are lacquered inside for enhanced brightness and attack and finished in natural hand-sprayed lacquer to show off the natural beauty of the wood and is neutral enough to match any drum kit. These drums provide warmth and a throaty backbeat. The Performance Series snare is available in all the same finishes as the rest of the drums, but also with the addition of Natural Clear Lacquer.